Today’s class was a good class. We worked on nikkyo ura and sSankyo Omote and Ura and koshi nage. We’ve done these techniques many times but it’s always a good thing from time to time to pick these techniques apart from time to time. Sensei does a really good job explaining our techniques from a body to body perspective as well as on a purely physical perspective. “Train Joyously.” If our world is our dojo what does that tell us? 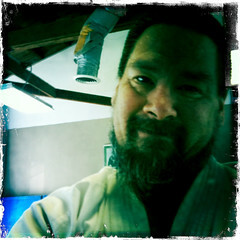 This entry was posted in Uncategorized and tagged Aikido, First Kyu, Joy, Process, Testing, Training by markdeso. Bookmark the permalink.